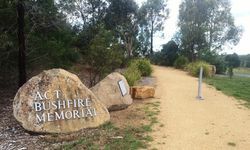 A memorial commemorates the impact of the 2003 bushfires, and to mark the process of recovery, and to thank the many organisations and individuals who played crucial roles in the fire fighting and recovery effort. 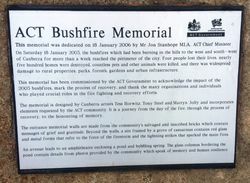 On Saturday 18 January 2003, the bushfires which had been burning in the hills to the west and south-west of Canberra for more than a week reached the perimeter of the city. 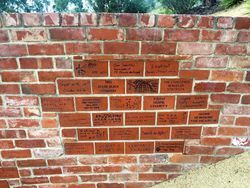 Four people lost their lives, nearly five hundred homes were destroyed, countless pets and other animals were killed, and there was widespread damage to rural properties, parks, forests, gardens and urban infrastructure. 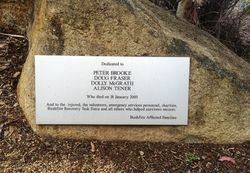 And to the injured, the volunteers, emergency services personnel, charities, Bushfire Recovery Task Force and all other who helped survivors recover. 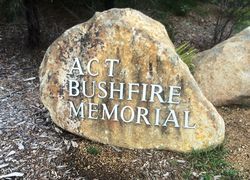 On Saturday 2003, the bushfires which had been burning in the hills to the west and south-west of Canberra for more than a week reached the perimeter of the city. 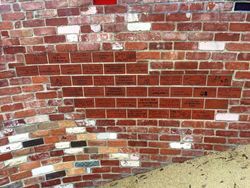 Four people lost their lives, nearly five hundred homes were destroyed, countless pets and other animals were killed, and there was widespread damage to rural properties, parks, forests, gardens and urban infrastructure. 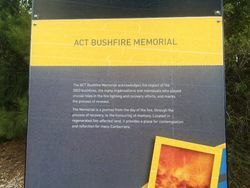 This memorial was commissioned by the ACT Government to acknowledge the impact of the 2003 bushfires, mark the process of recovery, and thank the many organisations and individuals who played crucial roles in the fire fighting and recovery efforts. 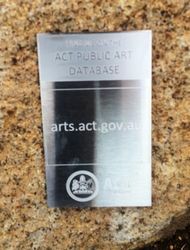 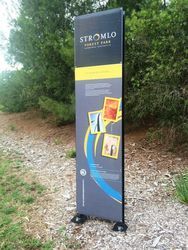 This memorial is designed by Canberra artists, Tess Horowitz, Tony Steel and Martin Jolly and incorporates elements requested by the ACT community. 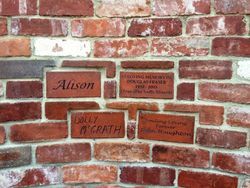 It is a journey from the day of the fire, through the process of recovery, to the honouring of memory. 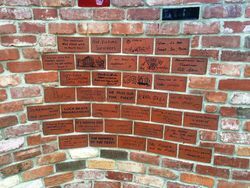 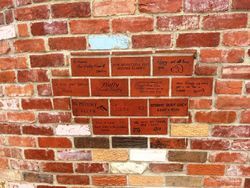 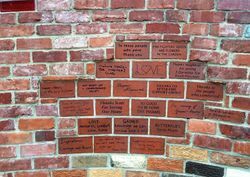 The entrance walls are made from the community's salvaged and inscribed bricks which contain messages of grief and gratitude. 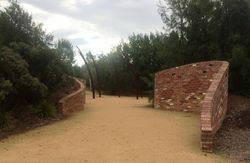 Beyond the walls, a site framed by a grove of casuarina contains red glass and metal forms that refer to the force of the firestorm and the lightning strikes that sparked the main fires. 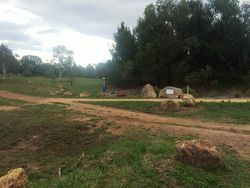 An avenue leads to an amphitheatre enclosing a pond and bubbling spring. 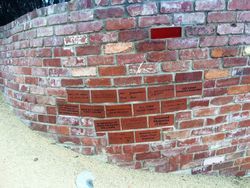 The glass columns bordering the pond contains details from photos provided by the community which speak of memory and human resilience.